In my post on Cauliflower Steaks, I alluded to making a side of barley to fill up any spaces that might be left by cauliflower steaks (there really weren’t any), and as a failsafe if the kids stonewalled and took the “required taste amount only” position on the main dish. So here I am, returning to the barley, to explain to you why it is ever so lovely to have a container of leftover barley in the fridge. I am a firm believer in grain variety. It would be very easy for my husband to eat rice every night, and I could probably have quinoa every day without complaint; however, I think a little variety does a body, and a palate, good. One of my favorite grains is super hearty, and super versatile, barley. I bought pearl barley (more about the varieties of barley here, and am curious about other, less processed versions of the grain. Although pearl barley IS slightly processed, the polishing of the grain is reported to leave it largely nutritionally intact. Cooked pearl barley is larger than rice, and soft while not being mushy. It’s a great base for foods, traditionally used in soups, and would be great in a risotto (barsotto?). I cooked my barley in water with a little salt in a 3 H2O to 1 barley ratio (I started with 2 c dry barley and we had PLENTY). Took about an hour, so it is not quick, but it doesn’t require any effort, so it’s a great candidate for a weekend cook to set up some grain dishes for the week. As an alternative, you could cook it in a slow cooker, which is what I think I’ll do next time. Regardless of how you choose to cook your barley, be sure to make enough for leftovers, as barley for breakfast is a delight. It’s warm and hearty, filling and nutritious, and it is not gloppy. While I love oatmeal, there are those who’ve expressed to me that the questionable texture of oatmeal and porridge is distasteful – barley may just be answer to these hot breakfast lovers. Barley is not gloppy and is a perfect vehicle for many of the same kinds of additions that can make a steamy bowl of oatmeal so very delicious. I’ll demonstrate with three options I’ve enjoyed this week. Tradition Takes Hold: My first barley breakfast was pretty traditional in porridge terms. I added some raisins, some cinnamon, some nuts, and a little shredded coconut (I am decadent, I know). Someone who is accustomed to a sweet breakfast could add a splash of maple syrup, although I found that the raisins and cinnamon did a nice job of convincing my palate that we were in the sweet enough zone. I also added a splash of almond milk. Warm, filling, energizing, comforting, and delicious. 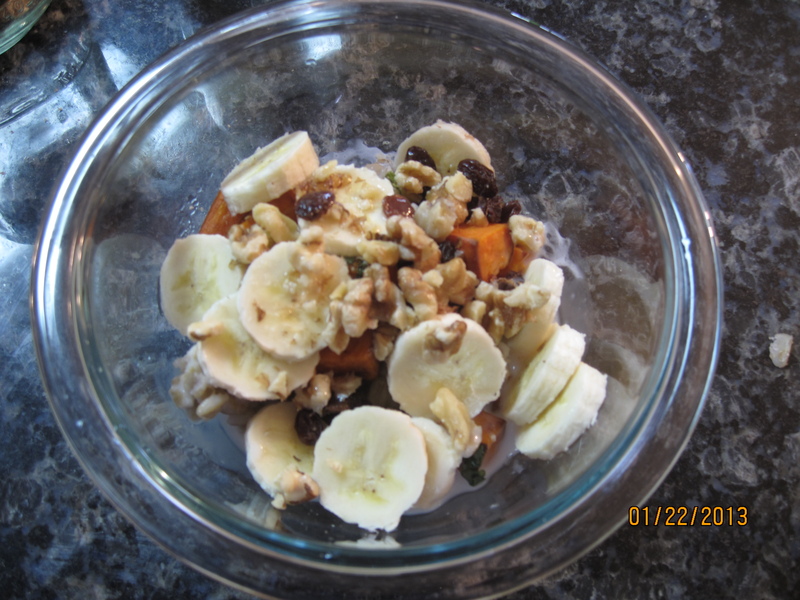 Everything a great winter breakfast bowl should be. A Little Lemon Lift: For my second barley breakfast, I remembered Bigg Sis’ superb soaked oats, which feature a heavy dose of lemon zest. While I was skeptical about this move when she first described them, I was delighted to find that the zest convinced my senses that it was simply a bowl of grains I was eating, but there was some sort of pastry situation in front of me. 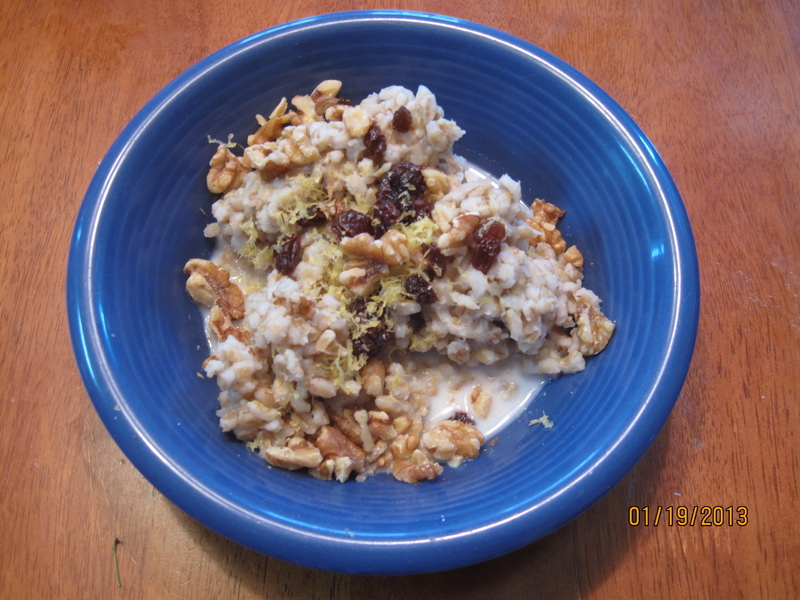 I’m still not sure how that works, but it still works, and so this breakfast included raisins, walnuts, lemon zest, and a splash of almond milk. Fantastic, and a light refreshing feel that brought a little ray of sun into the winter kitchen. Gettin’ a Little Exotic: For my final barley experiment of the week, I turned to another container of leftovers in the fridge. last night I roasted some sweet potatoes (1 inch cubes, 450 degrees, olive oil and a little salt for about 20 minutes) and then sprinkled them with lime juice and cilantro. They were stunning, if I do say so myself. Know what else? They were a great addition to breakfast. I used some barley and the potatoes, warmed them and then added raisins, some banana, walnuts, a splash of coconut milk and a squeeze of lime. If it hadn’t been 12 degrees here at the time, I would have sworn I was somewhere slightly tropical. Delish! So there you have it. Three lovely bowls of barley for YOUR breakfast enjoyment. All low in refined sugar, all cheaper than boxed cereal, and all super yum. 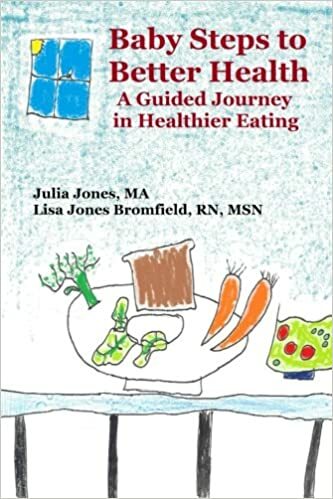 If you’re looking for a place to start YOUR path to healthier eating, may I suggest you start right at the beginning of your day. Check out our other breakfast options and pull up a chair! Barley for breakfast sounds delicious! I am truly loving this post – particularly the last entry. Why not add a little exotica to a chilly winter morning? It is in the teens here as well. Maybe the native Tennesseans will actually don coats? I am interested to see. Thanks for the delish ideas. I laughed when I saw the post title, as yesterday I cooked a broccoli-cauliflower risotto for supper with barley for the first time ever. I’m not sure that I’ve ever cooked with barley in my life before that! It made a very nice change, and it was deeply topical here as we’ve just finished Robinson Crusoe with our youngest, and in the story Crusoe grows barley as his main grain crop. I absolutely love the idea of it for breakfast, so thank you three times over! How wonderful that there is a literary tie-in as well as a culinary tie-in! Barley was also apparently on the menu for gladiators for its health properties. Ooh will have to try this, and the zest sounds very interesting! I agree about variety and barley is a good choice. I love the texture. And while I love oatmeal, I confess to enjoying the lack of gloppiness as well. Thanks so much for stopping by! Thanks! It really was delicious and hearty! Barley is such a fabulous whole grain with a unique flavor! Good anytime of the year but excellent for winter-headed-into-spring because it helps clear out excess mucous. Like your cereal ideas, especially with the lemon zest to lighten it up. Sounds delicious! I usually eat oatmeal for breakfast, but this would be a nice way to switch it up. Thanks for sharing! My pleasure. I am an oatmeal devotee, but can’t help but think that you actually can have too much of a good thing. ;-) Let us know if you give it a try! We love Barley grits for breakfast with a poached egg on top! I’d like to try that lemon zest idea… sounds interesting! I was thinking an egg would be a nice savory spin. The lemon zest was sensational. Let us know if you give it a go! Thanks for the inspiration! We do hot cereal most days here (toddlers love it). I like the lemon variation! The lemon really was delightful. My kids are not as willing to branch out in their flavor combos, but they do eat up some hot grains in the morning, so if they want to skip the lemon, I guess that’s okay. Thanks for stopping by! These look so delicious. I have a link party called Wednesdays Adorned From Above Blog Hop and would love to have you share this and any other posts with everyone. It runs from Tuesday night through midnight Sunday. Here is the link to the party. Thanks Debi – I believe we’ve already linked up there this week. Thank you for hosting and for dropping by! I wouldn’t have thought of eating barley for breakfast. In fact, I’ve only ever had it in soup. Great ideas here. Thanks for sharing on Wildcrafting Wednesday. Our pleasure Chris. I loved barley in soup as a kid and only over the last few years experimented with it out of the soup bowl. It really is wonderfully versatile. Thanks for stopping by! Mmmmmm, option three sounds the most delicious to me. Coconut and sweet potatoes are two of my favorite things! It was really good, and just the thing to warm me up in this deep freeze. Thanks for stopping by Jen! My mom used to add barley to soups, but I have never actually cooked with it. I’m always on the look out for new breakfast ideas (especially if I can buy stuff in the bulk section), so I may have to try this. It really was yummy – and I’m going to do it in the crock pot next – overnight for steaming hot breakfast. Yay! Thanks for stopping by! I love a good hot grain cereal for breakfast. Hope you have a great weekend and thanks for sharing your tasty recipe with Full Plate Thursday. Thank YOU for hosting Miz Helen and for being gracious enough to visit as well. Have a great week! My husband has recently declared himself almost vegan. Leaving off meat isn’t much of a problem. I’m struggling with dairy! Eggs, milk and cheese are in everything! I’m going to try some of this barley. I’m getting bored with oatmeal. I’m also going to take a look around your site. Thanks for sharing. I’ll be sharing this post on Pinterest! Thanks for the pin Laura! You should be able to find lots of dairy-free options here. My sister and I have both pretty much given up dairy over the last several months, and it’s been hard, but once I really started, I didn’t miss it as much as I feared. Let us know if you’re looking for something in particular! Great ideas. I do have one question. Does barley not need to first be soaked? If so, would that not cut the cooking time? Thanks for any input. I cannot wait to try these barley bowls. They sound YUM! Thanks for the question Carol! Barley CAN be soaked first (5 hours to overnight in 2 times as much water as barley) and then cooked in boiling water for only 15 minutes. Thanks so much for brining it to my attention as that’s a nice time-saver. Thanks for hosting Kristy – and for being nice enough to stop by as well! I’ve been diagnosed with several food sensitive and am currently on a rotation diet. It is good for your health and good for preventing food allergies. Thanks for sharing this on foodie friday. It’s all too easy to get overloaded on corn and wheat products, that’s for sure. Any variation seems like a good idea. Thanks for stopping by! Looks so yummy with fruit! So delicious and decadent. Thanks for hosting Diana! I have a big bag of pearl barley in my pantry! Bought it for soup and had a ton leftover. What great ideas! Thanks for sharing at Church Supper. Have a blessed week & come back soon. I smell delicious hot breakfasts in your future Krista! Let us know if you try it out! I have never had barley, but I am so glad you introduced it to me! I just ordered 5lbs online and can’t wait to try it (I eat oatmeal every day, so this might be a nice change in between)! I really love the texture of barley and it’s so versatile. Also truly wonderful in soups. Thanks so much for stopping by Jutta – see you next week! I have never eaten barley in anything but soup. These recipes look like a delicious alternative to my usual oatmeal! Thanks for sharing them! It is so delicious and so very versatile. I’m going to pul out the crock pot and make another batch tomorrow! Thanks for stopping by! Thank you for hosting – and for always being gracious enough to stop by! What a great idea, and so many ways to tweak it! Thanks Carol, it was a good breakfast week for me. 🙂 Thanks for stopping by! It is delicious! Let us know if you give it a try! And thanks for hosting Becca! I definitely am going to have to try this. I struggle to find “good” things to eat for breakfast and if it was already made and all I had to do was warm it up…..definitely an easy breakfast as well. Thanks for linking up to Healthy Tuesdays Blog Hop. So soft and comforting, like a good blanket, but for your tummy. I think the only time I have ever cooked with barley, was in a soup! That will have to change. Barley has a lovely flavor and a chewier texture than rice. A nice break! 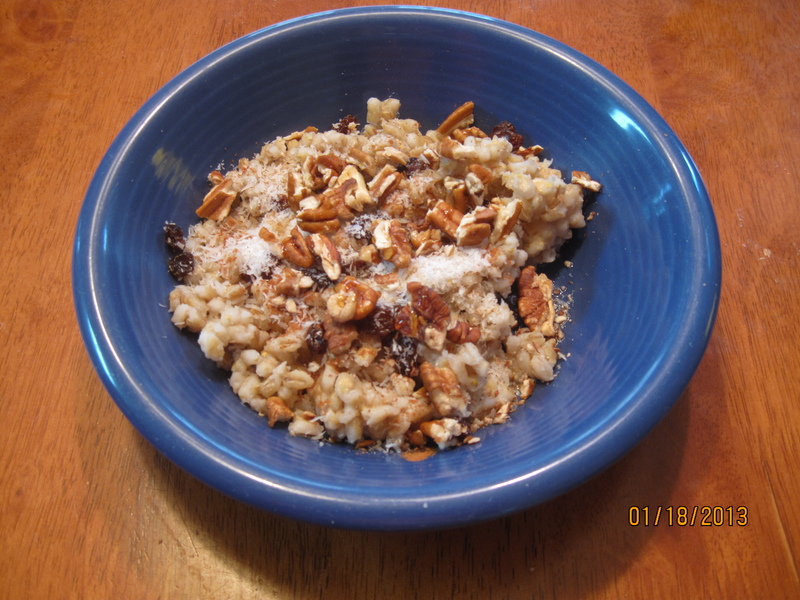 If you don’t like “traditional” oatmeal, I bet you’d live steel-cut oats. Oh we do love steel cut oats. And I find that I like traditional oatmeal so long as it’s from rolled rather than quick oats – less mush. Thanks for stopping by Lien! I do indeed. Honestly I’m down with any kind of oatmeal, but a little variety is always nice. Thanks for stopping by Lien!